SU carbs -riddle me this? #1 SU carbs -riddle me this? I read the history of the Etype on here which has been an absolute godsend to me, as I am looking to strip down my 1962 E type FHC over some months in preparation to handing it over to the restoration company I am going to use. The car was slightly unusual in that it was a LHD FHC, which I believe was picked up at the factory by it`s USA owner, who drove almost a year in England before then exporting it to the USA. The car lighting when new was to British specs,meaning orange and red rear light covers. The car was registered, and assigned WK 3366 from the Coventry office in 1962.. The heritage certificate shows this was a personal export vehicle, which occurred in 1963. 1/ The carbs have the correct AUC pre 1964 tags but the incorrect tag placement, having the R and C tags the wrong way around, so I am wondering if this could have been done by accident at the factory? 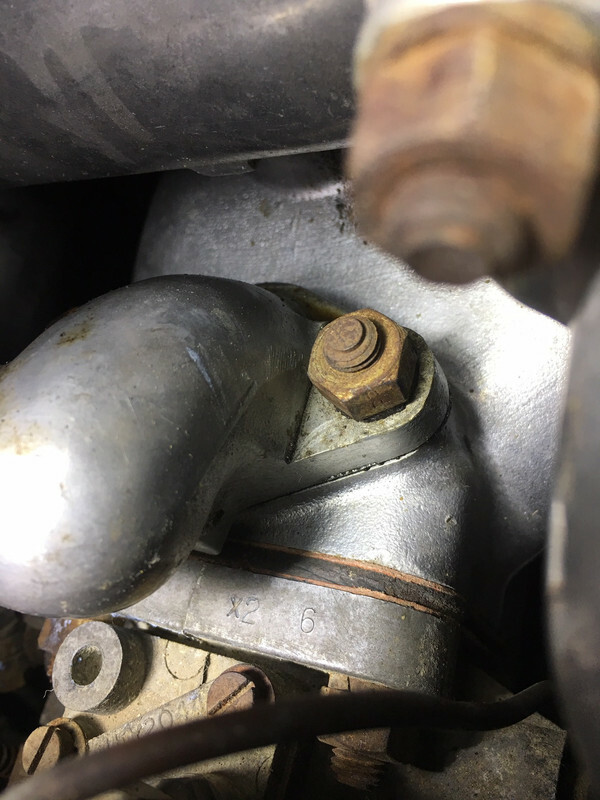 ( they do seem to have been in place many years)...The carbs and ancilliaries seem consistant in age with everything else in that area of the engine and bay, and it does not appear that they have been taken off and replaced incorrectly ( but who knows). More puzzling still, is that the date mark on the carburettor manifold shows X2..The F manifold reads X2 and a figure 6 set apart, the middle carb ( if correct as it is labeled R) shows just X2, and the rear carb simply has a number 6 embossed..
To compound the matter, the carb tops are brass, and are stamped with 0 which is what I would expect from a pre- Dec 1962 set, and not if the manifold dating is to be believed, Feb 1964. I wonder if anyone could offer an explanation? 2/ My sunscreen visors are the rectangular ones,with the plastic trim..I believe no USA car of that period was meant to have them, but they do appear authentic and original. I can only assume that as it was UK delivered, this may be why my car came fitted with this type of visor. 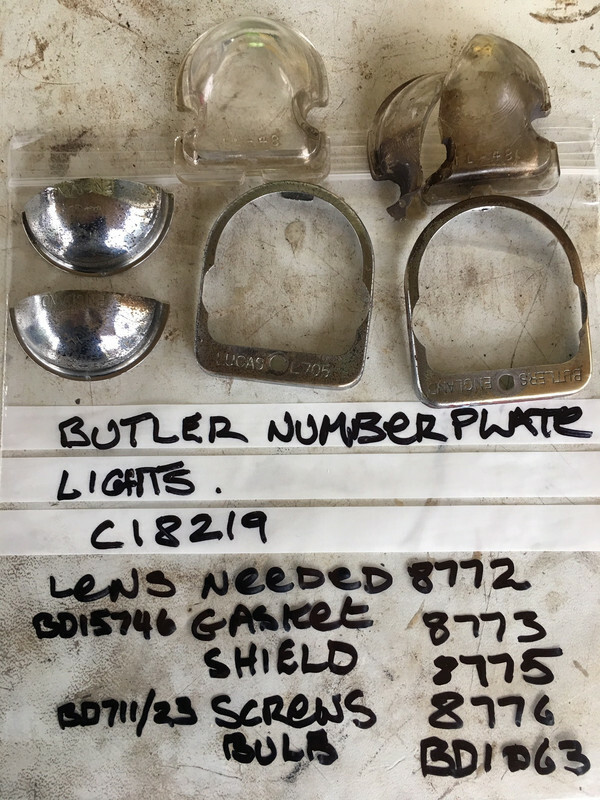 Any ideas or information would be most welcome..
As a post script to the excellent Factory fit articles...My car does have a Butler rear number plate light assembly on the left, and the Lucas 705 fitted to the right side. Last edited by Wilder on Sun Nov 11, 2018 1:41 pm, edited 6 times in total. #2 Re: SU carbs -riddle me this? The three carbs cannot casually be swapped because they are significantly different and would not go back on and hook up fully in the wrong position. Even the rear and centre float bowls on their own do not interchange, because the fuel inlets are handed. The float bowl lid screws and their attached tags were probably swapped accidentally. Obviously the manifold castings are also unique to their location.